You know, Mr. Bernstein, if I hadn't been very rich, I might have been a really great man. 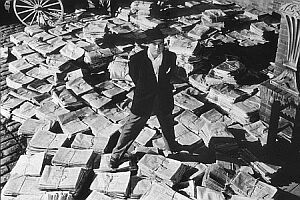 Citizen Kane may be the most talked about movie in film history. Recently it won the award as the American Film Institute's number one film. The snobby feeling alone of having this DVD on my shelf was worth the 18 bucks I spent with just a simple click on Amazon.com. After spending the last two hours watching this movie for the first time, I gotta be honest and say....it just didn't grab me. Call me a simpleton. Call me one step from trailer trash tornado bait. Call me what you will, but frankly, Kane seemed like a movie everyone would claim was the best just because they will end up riding a rail out of town otherwise. It is the same philosophy that gets people to think Titanic was worthy of an academy award or that Star Wars is really good science fiction instead of just cowboys and indians in space. Instead of us being able to toss away the old every now and then, we are faced with this insurmountable urge to like movies like Kane. Now granted I haven't listened to Ebert's commentary and given my ability to be swayed by a true film writer from Chicago, I am sure I will end up liking it just like everyone else. Right now, though, I am looking forward a lot more to my newly purchased copy of the Godfather Trilogy, even episode three. Ok, that out of the way, Kane isn't THAT bad. It is an interesting story that unfolds in a pretty unique way. I am a fan of movies that don't follow a general stream but are different cross sections of the same story. LA Confidential and Go are two good examples. We get different versions of the same story, each one filling in the gaps of the earlier. And only the last, most famous shot of film ever taken ends up tying it all together. Perhaps not knowing the answer to that simple question is what keeps people on the edge of their seat, but frankly, wondering if Wild Things is a bit more my speed. The DVD is a collectors edition that every good movie snob will want. It includes the commentary track I mentioned above hosted by movie writer Roger Ebert who knows what I mean when I talk about Neve Campbell's top. It also includes an entire disc of what might end up being the most boring content ever produced by humans. The picture is formatted in the film's original 1.33 to 1, so any kind of 16x9 enhanced picture would do no good, and the soundtrack is in the films native mono. Neither of these can be held against the original picture. The newly enhanced transfer did enough of a good job that I was never aware of it. Transparency is always a good key to sound and vision. The story should grab you, nothing more. I have often been told that I have jumped that line over into forcing movies to be something other than entertainment. I am called a snob some days and a fool others, but I simply try to force a higher standard on my entertainment than necessary. I try not to let a movie's reputation force me to like or hate it. If Lawrence of Arabia was simply a movie about sand, I would have called it as such, but instead we have Stargate which proves that you CAN make a movie about sand and still flop. With this in mind, I have to say that I wasn't that entertained by Citizen Kane. Still, it is a good DVD to have on your shelf just to prove that in some people's minds, you are above the herd animals who thinks that good evolution of entertainment is Who Wants to Date a Prince.